Joey Skaggs > Works > 1984 > WALK RIGHT! In December of 1984, Joseph Virgil Skaggs (a.k.a. Joey Skaggs), had had enough of the outrageous behavior exhibited by inconsiderate, unconscious, hostile pedestrians in New York City. 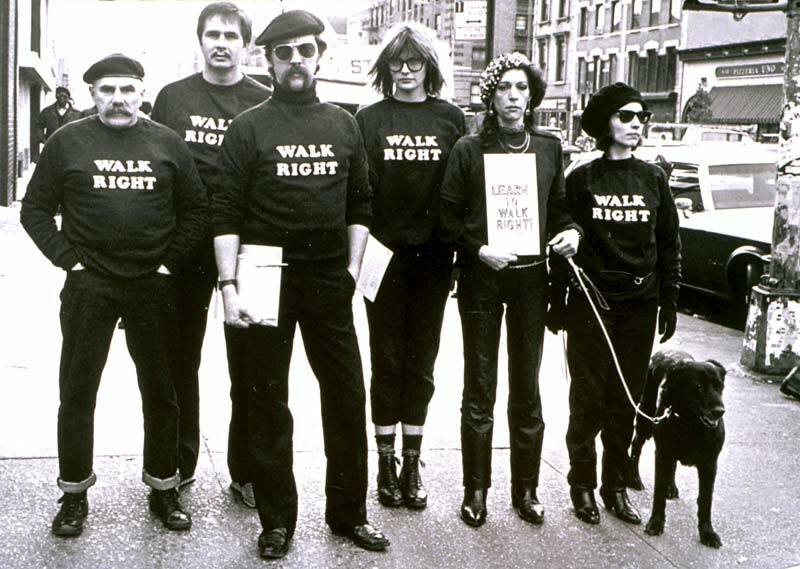 Skaggs formed WALK RIGHT! 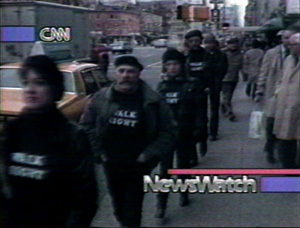 — an ad hoc group of vigilante sidewalk etiquette enforcers who patrolled the streets to make New York a better place to live and walk. Different types of lanes were to be established — one way lanes, a passing lane, window shopping lanes, etc. Pedestrians who violated the sidewalk rules were to be fined and forced to attend a WALK RIGHT! sidewalk etiquette school. WOR TV Channel 9 News and CNN, walked right into WALK RIGHT! WALK RIGHT! was featured on CNN (2:40) (video above) and WOR Ch 9 News. To see WOR Ch9 News, click this link and use password: WALKRIGHT!